A moderate Buddhist monk in Sri Lanka who is highly critical of an extremist Buddhist group has been found beaten and unconscious near Colombo. Wataraka Vijitha Thero was found undressed and with numerous cuts on his body in the district of Panadura. He is a vocal critic of the Bodu Bala Sena (Buddhist Brigade), whose rally in a southern town triggered deadly anti-Muslim riots on Sunday night. Four people have died in the sectarian violence, Sri Lanka's worst in years. Although there has been a lot of discussion of the violence on Sri Lankan social media, most mainstream media outlets on the island - with a few exceptions - have given little coverage and not sent journalists to report on the events, reports the BBC's Charles Haviland in Colombo. 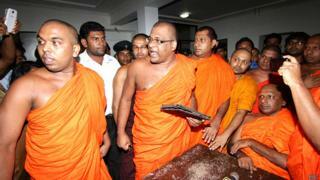 According to media reports, the BBS has denied being behind the assault on the monk. Wataraka Vijitha Thero has made statements supportive of Muslims and he has also complained to the police that he has received death threats. Many of the attacks on homes and businesses took place in the village of Welipenna, near the town of Aluthgama where Sunday's rally was held. There have also been attacks on Muslim businesses in two other towns in the south. An unarmed security guard from the Tamil minority was killed at a farm near Aluthgama. He was hacked to death and his Sinhalese colleague seriously injured when a Buddhist mob raided the farm. The mob was estimated to number between 50 and 120. The BBS is openly supported by Sri Lanka's powerful defence secretary Gotabhaya Rajapaksa, the brother of the president. On Wednesday, President Mahinda Rajapaksa visited the riot-hit area of Beruwala and promised military help in rebuilding ruined properties. But the most senior Muslim minister in his cabinet staged a boycott of parliament and said his own government - which is overwhelmingly Buddhist - did nothing to prevent the violence. Muslim activists have called on Muslims countrywide not to go to work on Thursday as a sign of protest. For the past couple of years, Sinhalese Buddhist revivalist groups have been staging demonstrations heavily laden with anti-Muslim rhetoric, usually led by monks. Muslims have called on the government to protect them from hate attacks by Buddhists. Some Buddhists have accused minorities of enjoying too much influence. Muslims make up 10% of the country's mainly Buddhist population.